A couple of weeks ago, I went to a book signing at The King’s English Bookshop, where Mo Willems read his new book, Goldilocks and the Three Dinosaurs. It is always a treat to hear an author read their own books, and he was no exception. He was funny and quirky, a true representation of the books he writes and the line around the block was proof of his broad appeal to kids and adults. We love Mo Willems' books at our house. It started with Knuffle Bunny (pronounced k-nuffle), we added Edwina, the Dinosaur Who Didn't Know She Was Extinct and Leonardo the Terrible Monster. Then we picked up Naked Mole Rat Gets Dressed and Hooray for Amanda & Her Alligator!. Last year for Mother's Day, the kids presented me with The Duckling Gets a Cookie!? and with a new reader in the house, we are now collecting the Elephant & Piggie books. REALLY?!? How many Mo Willems books do we need? I guess the answer is very simple . . . supply and demand. The kids love them, thus we will continue to fill our shelves. I have had I Broke My Trunk on my shelf for over a year and thought it was cute, but didn’t think I would be rushing out to buy more. Then I read it with my 5-year-old. Or, rather, she read it to me. She laughed out loud and wanted to read it again. 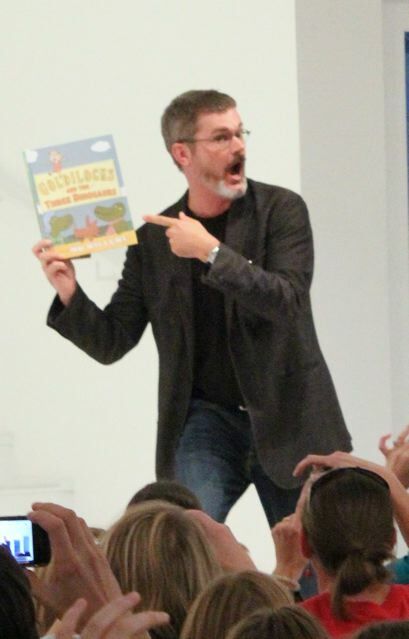 What is it about Mo Willems that is so compelling? 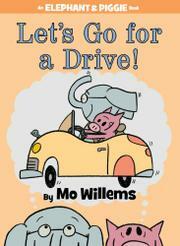 When I looked at the sheer volume of Elephant and Piggie books, I just shrugged them off as being a little gimmicky – but now, I own 6 of them and we are excited for the new arrival, Let’s Go for a Drive, that comes out next month. Where Dr. Seuss has rhymes, Mo Willems has mini plays. He is accomplished at making you feel like you are watching a show, and if you could put just down the book, you could act out the scenes yourself. Elephant and Piggie become these compelling and real characters who are just going about their day, living their lives – and when funny things happen, you get to watch! These are not sterile stories. Even the youngest readers are drawn into reading with emotion as the font size changes to extra big (for emphasis) or extra small (for shyness) and italics are added. Whether you are a little withdrawn and careful like Elephant, or you are creative and bold like Piggie, you are sure to find something to smile about. *If you have never picked up an Elephant & Piggie book, I recommend I Broke My Trunk! or Can I Play Too? (my 5-year-old also loves Happy Pig Day!). When I find something I like, I tend to stick with it. I always order Margherita pizza at Biaggi’s, write with 0.7-lead mechanical pencils, and buy the same brand of running shoes. But with such a wide variety in terrific pictures books, it would be a shame to get stuck in a rut when choosing books to read to my kids. (And to read to myself -- who am I kidding?) So today we have three new books from this year, each with very different (though all delightful) illustrations. 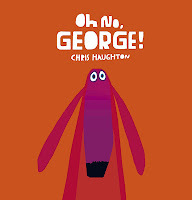 First up, Tara discusses Oh No, George by Chris Haughton. The books the kids love, and I can read over and over. Oh No, George! fits nicely in the third category. 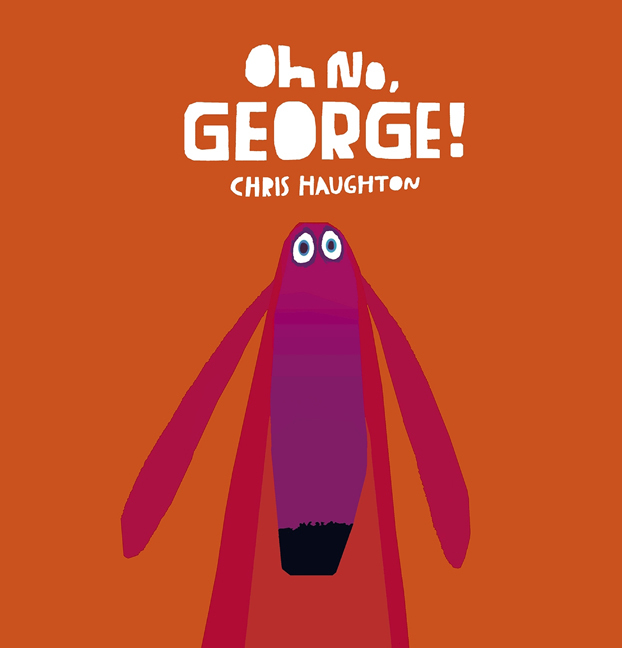 Set against pages filled with bold orange paint-tones, Harry with his green face and blue hair is dwarfed by his dog, larger-than-life George. This is partly what makes the book fun to pick up. The art is different enough to be unique, but not so out-of-the-box that the kids can’t recognize the characters. With minimal, boxy details and vibrant colors, the illustrations of George manage to express his personality so well that they really tell a story of their own. This is a story about a dog who wants to be good. He tries very hard to be good. But, sometimes he isn’t very good. Poor George reminded me of my little toddlers running around the house getting into trouble. I feel like I have had this discussion so many times. “Will you be good?” “Yes, Mommy.” Then, within a few minutes they are getting into trouble again. You know they had every intention of making you happy . . . until a better offer came along! It is nice to have a story where the character is trying to be better. Oh No, George! is an easy-to-read story that will have your kids saying, “I hope I’ll be good” in no time. Next, Diane talks about one of her favorites, Good News, Bad News by Jeff Mack. I loved reading this book! It was one of the books that I read over and over again. Rabbit and Mouse go for a picnic and, depending on how you look at it, the picnic went terrible, or it went really well. Bunny finds “good news” and Mouse finds “bad news”. Finally, it is all too much and Rabbit gives up, but a repentant Mouse decides to turn things around and find the “good news”. There are only five words in the entire book, with “good news” and “bad news” repeating throughout. So the mixed-media pictures with clean, black outlines really tell the story--a story that will keep kids laughing. My favorite part of the book is when Rabbit and Mouse are under the tree (good news) and an apple falls on mouse’s head (bad news); but they can eat the apple (good news) until they see the apple has a worm in it (bad news). It makes me laugh time and time again to see how well Jeff Mack illustrates the expressions on Mouse to make him look annoyed. The plot was hilarious, and the art was even better. Finally, Danyelle looks at I Like Old Clothes. 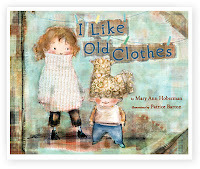 Mary Ann Hoberman’s 1976 book, I Like Old Clothes, got a make-over this year with new illustrations by Patrice Barton. Hoberman’s poem finds joy in old clothes, and Barton’s pictures extend the text, telling a story in pictures. The young narrator likes old clothes, “Clothes that were worn/Before I was born.” She collects clothes (with her brother in tow) from a second-hand shop and from a girl who is helping hang wash on a clothesline. Then she and her brother dress up in “Clothes with a history,/Clothes with a mystery,” and try on the hand-me-downs that seem all the more adorable for not quite fitting right. The girl wonders where the clothes have been as she cuts, trims, and sews to refit a dress for herself. (Then she playfully uses the fabric scraps to dress up her cat.) She remakes old socks into sock puppets and imagines games her dress may have once “played.” The clothesline hung at the center of the final double-page spread hints that the clothes will find yet another owner to appreciate them. Barton’s illustrations are all about texture. You can almost feel the weave in the plaid dress and the ridges of the corduroy pants. Polka-dots, stripes, plaids, and florals -- all in muted fabric-like swatches -- fill the pages. Sidewalks and walls in plaids and a faded canvas house with windows that resemble patches are especially fitting in a book about clothes, as are the zigzag stitches, pattern markings, and measuring tapes that Barton incorporates into the illustrations. Running stitches outline clouds and define flower stems, while the flowers themselves are buttons. Machine stitching runs loosely along the edge of the floor, window frames, and a house edge. 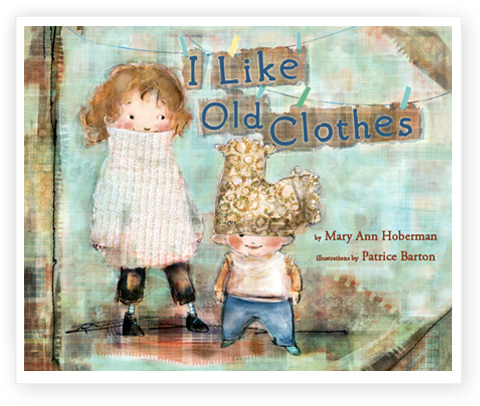 With theme-supporting elements, the exuberant illustrations give new life to this book about old clothes. Pick up a picture book and think happy thoughts. 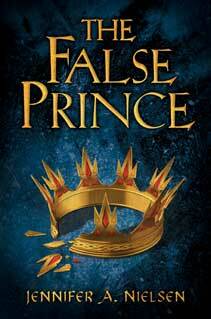 Whether reading The False Prince for the first time, or reading it for the third, this book kept me on my toes. It has many twists around the corner that kept me awake. Sage, an orphan boy, and three others like him, are taken and pulled into Conner's devious plan. This is really all I can say, without giving away all the suspense of the book. "'Who amongst you rides a horse? In a gentleman's style?' Again, none of us answered. I'd ridden a horse several times before, but in all my recent experience, it was usually stolen and always in an attempt to escape the horse's owner. That probably wasn't a gentleman's style." Sage only tells you the very little that he would tell someone else, and for someone who, "doesn't trust anyone", that isn't much. Looking at many reviews for this, this book would appear to be YA. I think that maybe the people who are saying this have not read the book, and certainly do not have teenagers. This book was exceptional−just, it wasn't for teens. I would suggest it to older middle readers, or younger young adults. (Like, maybe 10−14 year olds). 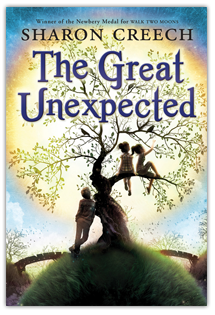 But, it was still a wonderful book, and I would suggest it to anyone who likes to read middle grade readers. One of my favorites from all year! I can't wait until the next one comes out!!!! I wonder what would happen if I tried this, "truth" deal with my mom . . .
A few years ago while I was roaming the library, I happened upon Sharon Creech. I instantly fell in love with her books. I read all of them starting with Walk Two Moons and ending with Chasing Redbird. So, when I heard that Sharon Creech had a new book coming out, I was thrilled, and the day it came out, it was in my hands. Naomi and Lizzie--two best friends--live in a strange town. All the kids have very different circumstances, but none of their biological parents are active in their lives. Lizzie lives with her, "foster parents, who are definitely going to be her adoptive parents." and she is very bubbly. "Oh, lar-de-dar, the sky is so blue; the fields so green, oh, lar-de-dar." Naomi, on the other hand, has a lot of background that she likes to keep secret from everyone--including the reader. Finn, a boy who is mysterious and suspicious in all ways possible, fades in and out of the story as the summer unravels. The two girls finish their summer with the best ending they could ever have, but not in the way they were thinking. There are two stories going on that intertwine in the end, but you can definitely tell--by the chapter headings, when you change stories. Lizzie was my favorite character throughout the entire book with her, "Lar-de-dar" in a high pitched voice. Lizzie was constantly making me laugh, and I really liked the relationship the reader feels with her through Sharon Creech's words. I liked this book because it was about two best friends growing up, and how they have trials of one sort or another. Also, it had a tiny bit of romance. "Finn was floating toward me. Truly, I think he floated on the air . . . He glided toward me. He floated toward me. I felt I would faint. I was hallucinating. His lips touched my cheek, lightly, like the swish of a butterfly's wing, and because I felt awkward and did not know how to respond, I lifted his hand and softly kissed his palm." I have loved Sharon Creech's books in the past, but I was a little disappointed with this one. It was good--but it just wasn't what I think of as "Sharon Creech good." However, it was a very fun book to read, and I would recommend this book to many kids. I loved the ending though, and Sharon Creech is going to have to write a sequel to it soon . . . . Everywhere I go lately, I run into--or at least trip over--conversations about Common Core State Standards. While opinions on the initiative's implementation vary, one thing seems inevitable: with a recommendation that 50% of the texts for grade school students and 70% for high school students be informational, teachers will be seeking out more nonfiction books for their classrooms. When I was a kid, I certainly felt this way. My textbooks were boring, and I read other nonfiction primarily to find boring answers for reports (probably also boring) that I had to write. For years I derived little pleasure from my nonfiction reading. About five years ago, that changed when I started reading some of the newly published nonfiction titles, and found that I actually enjoyed them. These books were not the boring books I remembered from my childhood, but books with fresh perspectives, interesting details, engaging narratives, and well-chosen photographs and illustrations. More than just facts strung together to create sentences, paragraphs, and chapters, these books told stories, explained phenomena, and opened worlds. In fact, for the past few years, several of my favorite children's books have been informational ones. Marching for Freedom: Walk Together Children and Don't You Grow Weary by Elizabeth Partridge (2009). This narrative about the role children played in the fight for the right to vote is excellent, and boy, does Elizabeth Partridge know how to choose photographs that pack a punch. Nic Bishop: Lizards by Nic Bishop (2010). We love anything by Nic Bishop at our house. (Okay I have a hard time reading Spiders, but that is just because I am squeamish.) For the photographs alone, I would love this book. The great descriptive text is an added bonus. The Notorious Benedict Arnold: A True Story of Adventure, Heroism & Treachery by Steve Sheinkin (2010). This is history nothing like the one paragraph I remember reading in my textbook about Benedict Arnold--riveting. Me . . . Jane by Patrick McDonnell (2011). This picture book looks at Jane Goodall's passion for her research by focusing on her dreams as a child. Balloons Over Broadway: The True Story of the Puppeteer of Macy's Parade by Melissa Sweet (2011). Impressive for the fact that it inspired me to watch the parade on Thanksgiving (well, some of it anyway), this tells the inspirational story of how the puppets in the Macy's Parade came to be. Beautiful illustrations enhance the clear, straight-forward text. Amelia Lost: The Life and Disappearance of Amelia Earhart by Candace Fleming (2011). 2011 was the year I fell in love with books that I didn't want to like. I don't like parades, didn't think I would like a picture book about Jane Goodall, and certainly was not interested in reading about Amelia Earhart. But this book about Amelia Earhart won me over. Candace Fleming alternates the story of Earhart's life with the search for her after her disappearance, creating tension in a story that was hard to put down. 2012 is turning out to be another great year for nonfiction. Look at just some of the recently published titles. There is not enough time in my day to read all the promising books this year. Some of my children prefer factual books to fiction. Without any encouragement from me, they choose to read stories that actually happened, look at photographs of fascinating--yet real--animals, and read about scientific discoveries. But persuading those who are a little reluctant to pick up a nonfiction book should be easy (or at least easier) with all the great books being published now. And I guess I'm going to have to finally admit that I'm a big nonfiction fan. I did not know anything about this book before I read it, other than the fact that is was written by Laura Amy Schlitz and that I loved The Night Fairy. The cover art was intriguing and the title was unique and mysterious. I was pretty excited to dive into the story. The prologue set up a dark story that promised love, magic, control and pain. The rest of the book delivered all of those things. It is reminiscent of a Grimm’s fairy tale with dark magic and wicked adults abusing children – almost a blend of Hansel and Gretel and Pinocchio mixed in with her own unique story. This story is expertly crafted and the characters are developed exceedingly well. 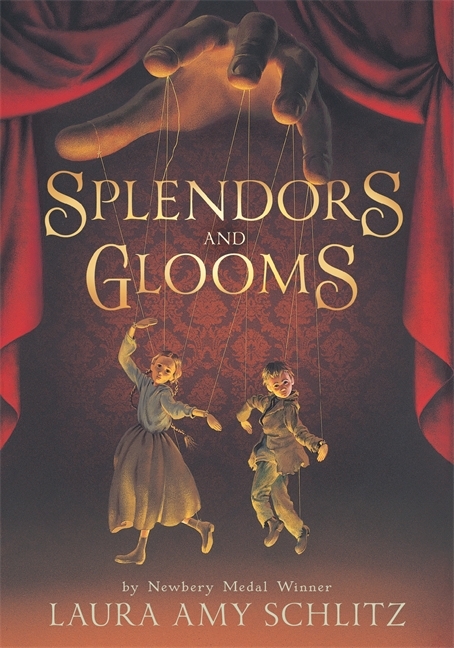 Lizzie Rose is a poor starving orphan who will steadfastly hold on to her manners and integrity, Parsefall is a small, malnourished and abused orphan who has been molded into a thief and has the natural talents of a puppeteer, and Clara is a rich, slightly spoiled, but very lonely little girl who craves love. If you mix in a crippled witch and a cruel and selfish puppeteer guardian, you can see where this story may lead. You have two orphans who are oppressed and used as slaves by Grisini (the master puppeteer) and then the plot thickens when Clara disappears after having them perform a puppet show at her birthday party. The police suspect Grisini has kidnapped Clara, but when he also disappears, Lizzie and Parsefall are afraid they will be in trouble with the law and need a place to hide. They are drawn to a witch’s home where they need all of their willpower and cunning to escape a harrowing future. At one point, it talks about “the splendor and glooms that haunted [Parsefall’s] mind.” “She shared his appetite for prodigies and wonders, for a world where spangles were stars and skeletons frolicked until their bones fell apart.” Laura Amy Schlitz has a talent for making language beautiful, and in the case of this book – also, a little dark. If you enjoy dark fairy tales, you should love this book. It is an interesting, original tale that has a satisfying ending. If there is a downside, it would be an utter lack of humor (except what comes through the quirkiness of the characters). But, then again – perhaps that lends to the seriousness of the story. The references to blood and magic did induce a few nightmares when I fell asleep reading one night, but that is probably just a testament to her vivid descriptions and lively characters. She is just that good at pulling you into her reality. In the end, the story is about love and security. It touches on those universal themes of decency, friendship and family. Even though I found some parts to be a little slow, the uniqueness of the fairy tale story and the beautiful language puts this is on my list of favorite books this year. *There is one instance of swearing (b****h) that seemed unnecessary and the subject matter is probably for a more mature audience. 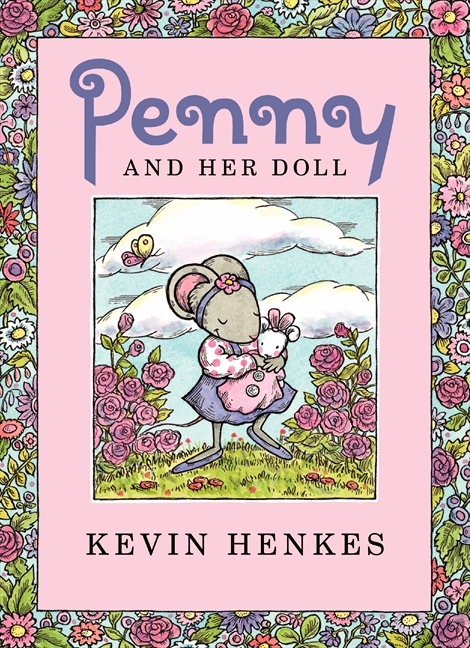 Because I have a kindergartner who is learning to read, I have recently spent a considerable amount of time with easy-to-read books, so I was delighted to learn that Kevin Henkes, author and illustrator extraordinaire, had created two new books for these young readers: Penny and Her Song and Penny and Her Doll. With a trim size typical of easy readers, each book combines plenty of illustrations, short lines, repetitive text, and ample white space to make a story accessible to beginning readers. Even better than that, these books are fun to read. 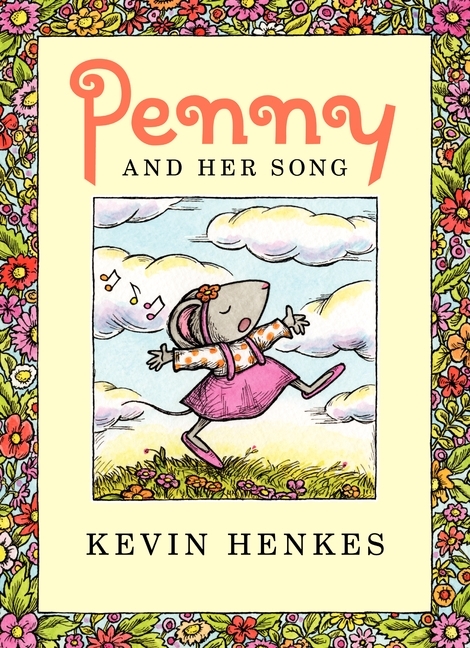 In Penny and Her Song, Penny comes home from school excited to share her new song with her family, but she is interrupted at each attempt by Mama and Papa telling her the babies are asleep. As she waits in her room, trying unsuccessfully to sing to herself, the repetition that dominates the first few pages is broken, and the pace of the story slows, intensifying the feeling of waiting for the reader. Penny’s frustration and growing impatience are evident as she moves her glass animals around on her dresser and makes faces in the mirror. After dinner, when Penny finally gets to sing her song, the family joins in, with even the babies singing “in their own baby way.” Now she has a chance to shine as they sing and sing and sing together, and Penny enjoys her parents’ attention. Penny and Her Doll begins with Penny and Mama working in the garden where Mama finds weeds, while Penny finds flowers. The mailman brings Penny a package containing a doll from Gram. “The doll had pink cheeks. The doll had a pink bow. Penny loves her new doll, and the illustrations of Penny holding and hugging her doll mirror those of her parents with the babies. I love the family dynamic in this story. Mama and Papa are supportive, and when Penny needs a name for her doll they are even a little helpful, but the focus is always on Penny, and ultimately she is the one who must solve her own problem. When she finally does, she beams, and I couldn’t help but smile with her. These are two books that will be well-loved at our house. I sure hope that Mr. Henkes has a few more Penny stories to tell.